"Therers"s no question yours"re going to be a better Flex and Rails developer when yours"re done reading this book." From the Foreword by Matt Chotin, Senior Product Manager, Adobe Systems, Inc. Adobe Flex enables the rapid development of rich and engaging user experiences. Ruby on Rails dramatically simplifies the development of database-driven web applications. Now therers"s a book that shows how to use the newest versions of both frameworks together to create state-of-the-art Rich Internet Applications (RIAs). Flex on Railsbegins with the absolute essentials: setting up your environment for Flex and Rails, passing data with XML, and integrating Flex front-ends with Rails back-ends. Then, using practical, easy-to-understand code examples, the authors take you from the basics to advanced topics only discussed in this book. Techniques covered here include Constructing sophisticated interfaces that canrs"t be created with AJAX alone Using RESTful services to expose applications for access via APIs Testing Flex and Rails together Using Flex Frameworks Getting Flex into your build/deploy process And morehellip; The authors also offer practical introductions to powerful complementary technologies, such as RubyAMF and Juggernaut. 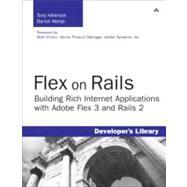 Written by developers with extensive experience using both frameworks, this book covers the new Adobe Flex 3 and Ruby on Rails 2 from the ground up. Even if you have minimal experience with Flex or Rails, yours"ll learn all you need to know to use them to build exceptional production applications. Tony Hillerson is a Software Architect for EffectiveUI. He graduated from Ambassador University with a BA in MIS. On any given day, he may be working with Flex, Java, Rails, Maven, Ant, Ruby, Rake, Capistrano, or shell scripts. Tony maintains RubyAMF, a Rails plug-in that allows Flex applications to pass AMF messages to and from Rails. Tony has been a speaker at 360Flex, Adobe MAX, and RailsConf, as well as local user groups. In his nonexistent free time, Tony enjoys playing the bass, playing World of Warcraft, making electronic music, brewing beer, learning Latin, and studying philosophy. Tony lives outside Denver, Colorado with his wife and son, Titus. Daniel Wanja, a native of Switzerland, currently lives in Denver, Colorado. He has lived in Denver for more than six years with his wife and three children, ages 5, 3, and 5 months. Daniel is a dynamic, skilled enterprise software architect and developer with over 20 years’ experience. He has worked in the banking, insurance, and high-tech industries around the world delivering mission-critical software. Daniel is president and part owner of two Flex and Ruby on Rails consulting agencies, Nouvelles Solutions, Inc., in Denver, http://n-so.com, and ProDesign Sarl in Geneva, Switzerland, http://prodesign.ch. Daniel started the http://onrails.org blog on Ruby on Rails and related matters in 2005.